With so many cartridges to consider, which one is best for wapiti? Here in North America “big game” starts with deer. That’s the primary game for many of us, but one size doesn’t fit all. In many areas a 100-pound deer might be normal, but mule deer and whitetail bucks exist that are triple that size. A monster buck is different from a fork-horn or a fat doe. Even so, most experienced deer hunters have pretty good ideas on appropriate rifles. Likewise, so do experienced western elk hunters. However, the majority of American deer hunters don’t live in elk country, but many dream of going elk hunting. An elk is bigger than anything most deer hunters have encountered, but there’s still a variance; a cow for the freezer isn’t much bigger than a very large deer, but a mature bull elk is different. Although such weight is rare, a big bull can exceed 1,000 pounds. Actual weight depends on subspecies, nutrition, and age, but 600 pounds is a good starting point for grownup bulls and twice the size of an unusually large deer. Size aside, American elk are very tough creatures. They live in steep, rough country, and their long legs cover a lot of ground. I have never lost an elk, and I do not recall ever tracking one for recovery. So while some of my rifle choices may have been oddball, none of the rifles I’ve used for elk have been exactly wrong. There are many good choices, and shot placement is more important than case dimensions and bullet diameter. Here the elk offers hunters an advantage because the vital zone, like body size, is at least twice that of any deer. On the other hand, you must hit it well, because if poorly hit, an elk shows strength and stamina and may cover many miles of tough country. There are places where .22 centerfires are legal for elk. Sure, you can get away with it, especially with today’s extra-heavy bullets, but I think it’s foolish. Many western hunters annually take elk with 6mms and .25s. I won’t go so far as to say that’s foolish, but there’s a major difference in size and toughness between a cow or spike and a mature bull. There’s also a mindset difference. Folks who live in elk country may consciously seek a cow for the freezer. Also, many of these hunters have the luxury of a long season close to home. They can take their time and pick their shots. I would never argue that a .243 Winchester with a good bullet placed well, or certainly a .25-06 with a tough, heavy bullet, can’t do the job. I am convinced there are better tools, and there’s also that matter of mindset. The hunter from afar, journeying into unfamiliar country, must also accept the pressure of a limited period of time and the knowledge that it may come down to just one chance. The rifle, cartridge, and bullet must be capable of handling that one opportunity. And the hunter must have full confidence in his or her choice. Cartridges of .25 caliber and below are not ideal elk cartridges, especially if a big bull is a potential. I am often criticized for following the “Elmer Keith school” in suggesting powerful cartridges. I shot my first bull elk in Montana’s Pioneer Mountains on a snowy Thanksgiving in 1972. My .375 H&H seemed quite adequate. Since then, I have often recommended “medium bores,” such as Elmer Keith’s favorite .33s, and I’ve used the 8mm Remington Magnum a lot. These work, but my thinking has changed over the years. Today we have better bullets than when I was a kid. Also, after a few dozen elk hunts, I’ve seen many taken effectively with lighter cartridges. In the ’80s, when Jack Carter was making his Trophy Bonded Bearclaw bullet by hand, I did some elk hunting with the 240-grain .375 version. You bet they worked! Honestly, the concept of being “overgunned” is somewhat mystifying to me, provided you can place the shot. So if you have a .375 (or larger) and a yen to take it elk hunting, be my guest. But there is no compelling reason to consider a caliber larger than .35. The .35 Whelen is a fine elk cartridge. So are the .350 Remington Magnum and .358 Norma Magnum. Now, I have to go out on a limb and say that sensible elk cartridges aren’t all about power. Equal in importance is that you can hit the elk. I am not into the current long-range fad, especially on powerful animals like elk. I have needed to reach 400 yards, but never a whole bunch farther. Most rifle elk hunting is not like bowhunting during the bugling season. Movement is more random in big country. You get the shot you get, and within sensible limits, you must be able to take the shot offered. I’m going to rule out short-range cartridges that have the power because there’s no sense in making the shot more difficult than necessary. These include some of my favorites, such as the .358 Winchester and .45-70. There are specialized situations where close shots are the norm, but most often, the ideal elk rifle should have enough versatility for shots out to 300 yards and change. Sometimes you get a point-blank shot; other times you need to stretch it a bit farther. But in my experience, if you can cover that 300-yard window with confidence you’re in good shape. I’ve obviously left the door wide open. Between the .25s and the .35s are dozens of cartridges that are versatile and suitable. You can start with the 6.5mms. The 6.5mm Creedmoor and the old 6.5x55 are sound minimal choices, adequate to 300 yards. Faster 6.5s—the new 6.5 PRC, the old .264, or the super-fast .26 Nosler and 6.5-300 Weatherby—will deliver more energy and open the range envelope a bit. Then come the .270s. There was a time when I questioned the adequacy of the .270 for elk. I was wrong. I’ve seen many elk taken cleanly with a .270 Winchester, and my own longest shot on an elk was on a big New Mexico bull at 400 yards using a .270 Winchester with a 150-grain Nosler Partition—one step and down. The .270 WSM and .270 Weatherby deliver more energy, but all three are fine. The full spectrum of our many 7mms, from 7mm-08 and 7x57 on up to the fastest 7mm magnums, are also fine, but they are not magical giant-slayers. There is only .007-inch (seven thousandths) difference between the .270’s .277-inch bullet and the 7mm’s .284-inch bullet. This is not enough to argue about, so I’m not convinced that the 7mm is better than the .270, but you can stoke it with a heavier bullet. Then come the .30s, and now we’re talking business. The .308 Winchester is a fine elk cartridge, and the grand old .30-06, with a bit more velocity and energy, is better. The numerous magnum .30s are also excellent, but they deliver more recoil. As I’ve said, I like mediums, such as the unpopular 8mm Remington Magnum and the faster .33s. These are elk cartridges, and as Jack Atcheson Jr. likes to say, the .338 numbs them. But they are not essential, and despite their effectiveness, all magnums from .30 caliber upwards generate more recoil than many folks are comfortable with—and are able to shoot well. We argue cartridges and calibers endlessly, but bullet choice matters. Elk bullets must be tough enough to provide adequate penetration. Choose at least medium weight for caliber: 140 grains in 6.5mm and the lighter 7mms; 140 and 150 grains in .270s; 150 to 160 grains in faster 7mms; 165 or 180 grains in .30 calibers. Avoid quick-opening bullets, especially match bullets; instead, choose controlled-expansion designs intended for hunting larger game. 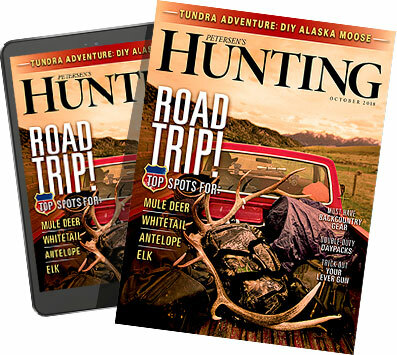 Elk hunting can be extremely physical—not only steep country, but also altitude and sometimes deep snow to buck. My 8mm Remington Magnum was stocked in dense walnut and had a long barrel. All in, it weighed over 11 pounds, which is too heavy. Today, rifles can be made very light, but that can also be overdone because light rifles are whippy and hard to control when you’re out of breath and have to settle in for a quick shot. Around eight pounds set to go is a good compromise. Synthetic stocks aren’t always lighter than wood, but they are stronger and more stable, and elk hunting can be hard on rifles. Synthetic wins over laminate because laminates, strongest of all, are also heaviest. With today’s interest in long-range shooting, big scopes are in, but powerful scopes add weight. An elk offers a large target, so extreme magnification shouldn’t be necessary. A medium variable in the 3-9X or 2.5-10X range should be enough scope for elk hunting. I believe in quality optics, but quality and magnification are not synonymous. Twenty years ago, I might have said .338 Winchester Magnum was the perfect choice for elk. It’s still a fine choice, but I don’t have a .338 right now. Mark Bansner is making one for me: synthetic stock on a left-hand Sako action. I won’t be ashamed to take it elk hunting, but today I’m certain that level of power is not essential. For the one perfect all-around elk rifle, I’m not sure you can beat the good old .30-06. 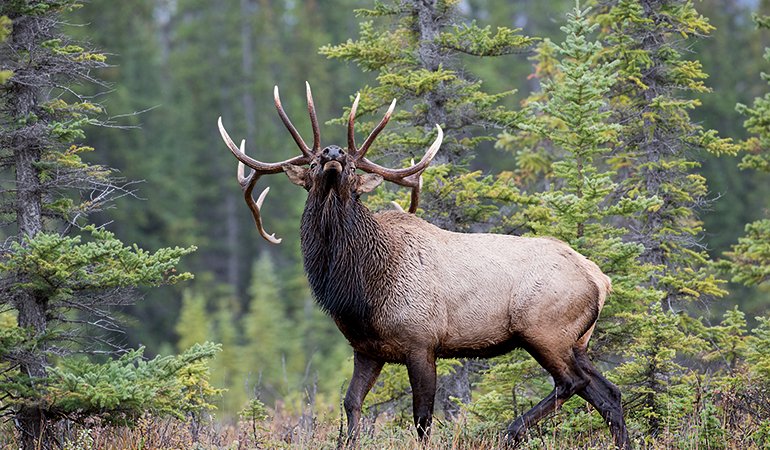 In its 112-year lineage, it has probably taken more elk than all other cartridges combined. Make no mistake, the .30-06 is a powerful cartridge, but it doesn’t beat you to death and can be built in the seven- to eight-pound range. And with modern powders and loads, it knocks on the door of the .300 WSM and .300 Winchester Magnum. I’d mate it with a good 180-grain bullet, top it with a one-inch-tube scope (to save weight), and go elk hunting. Honestly, I’ve taken as many elk with the .30-06 as with any other cartridge, and the farthest at 350 yards was no problem. Coming from me, this conclusion may shock you, so let me give you another surprise. I think Jack O’Connor, the great champion of the .270, would agree. He never questioned the adequacy of his .270 for elk, nor do I, but he was also a lifelong .30-06 fan and privately conceded its superiority for elk-sized game. Trust me, you could do worse, but you’ll be hard-pressed to do better!